An easy route suitable for the whole family that climbs up to the old castle of the Montpalau family. Leave the village of Sant Jaume down the street to El Molí and the river. Cross over and follow the track through the woods as far as a junction with the signpost G177 Ctra. del Molí. Here, turn right following the indications to the church of Montpalau and start to climb. After a while, when you reach a minor road crossing an open grassy area, initially keep straight on but then, almost immediately, turn right up a track that heads up into the woods. Start to climb steeply and then, after a sharp right-hand bend, continue to climb until the wall of the church hoves into view at the top of the track. This church was once the chapel of the castle of Montpalau, which was built by Arnau de Sales at the beginning of the 13th century. A few years after his death, his widow, Alamanda, built the church, which was consecrated in 1228 by Bishop Guillem of Girona, from which point the church came to form part of the diocese of Girona. From the 14th century onwards the church was dependent on the church of Santa Maria d’Argelaguer in the neighbouring village. Next to the church stand the ruins of the castle of Montpalau, which was initially subject to the castle of Sales. However, in 1216 its owners, along with Argelaguer, granted the castle to the Montpalau family, who from the 15th century onwards lived in Argelaguer. 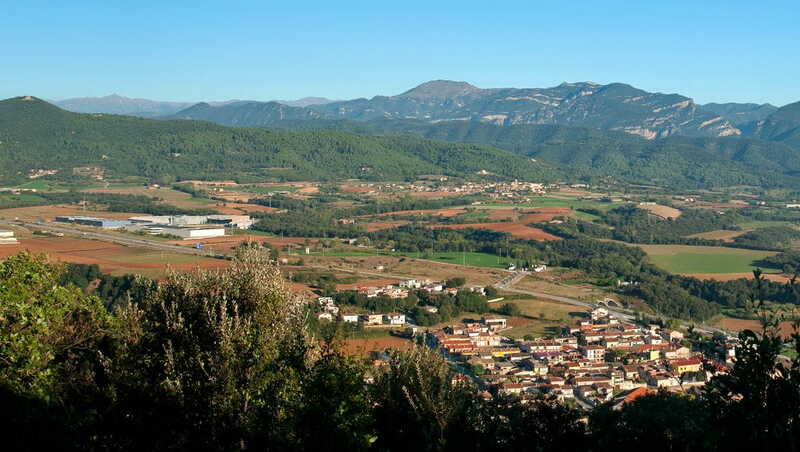 From the space in front of the church there are excellent views of the mountains of L’Alta Garrotxa. You can walk back to Sant Jaume along a narrow path that starts from the church: leave the church behind you and head along the hill top towards the remains of the castle, from where the path starts to descend quite abruptly into the holm-oak forest. Come to a water deposit, where you should keep left and then almost immediately left again. Soon you come out on to the minor road that climbs up to La Miana; turn right and in 100 m you will come to Itinerànnia signpost G178 Ctra. de la Miana; from here continue down towards ‘Sant Jaume de Llierca’. Follow the road downhill, past the spring of Font Pudosa and then across the river. The road passes by a series of allotments and an old brick factory before entering St Jaume along Carrer Indústria and on to main road from where the walk started.